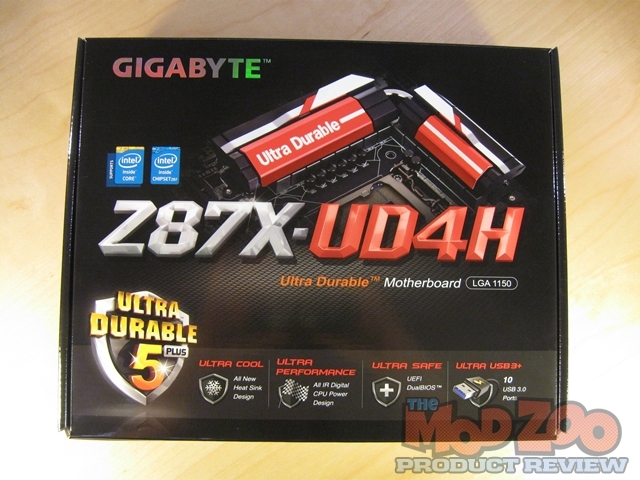 Gigabyte has been a leader in Motherboards for many years. Their boards are “Ultra Durable” and known for their reliability. Their artistic color palette brings flair to every motherboard they sell. They’ve even diversified into making some pretty awesome Graphics Cards. All in all, they are considered to be in the top echelon of motherboard manufacturers. Well, the new Intel “Haswell” chip has brought a change to this motherboard giant. The packaging is flashier, and the boards involve new darker, color schemes. Now the inside of your case can be a piece of art too! They’re loaded for bear, and aiming for the enthusiast PC market. They even have a new motherboard with on board liquid cooling water blocks! * Use either the GSATA3 6, 7 connectors or the eSATA connectors at a time. Nice review Greg, it’s a sharp looking board. BIOS looks pretty snazy, I’ll be looking forward to you revisiting the board and sharing more thoughts on it. This board is loaded with features, and agree with Stuart about the BIOS. Thank you for the review Greg! For the price, I think this is a really nice board, and has a lot of features that an enthusiast might want. I just wish it had a better PCIe layout. I’m not a fan of having a couple PCIe X 1 slots in the middle of the PCIe X 16 slots. Great review as always Greg. I agree with Jesse, I think the PCI(e) slots could be laid out better, but overall I like the board. Thanks for the review, Greg. Great review Greg, Gigabyte have certainly upped their game with the last 2 generations of motherboards in terms of feature set, easy to use BIOS’s (be it they seem to omit silly things on the first attempt, that being a minor gripe IMO) and pricing. I’m in agreement full with XNine as regards the OTT branding resembling a Duracell battery however lol and likewise it would be nice to have the additional room around the CPU socket (it saves having to shop around for an air cooler to fit for example). I just wish it had a better PCIe layout. I’m not a fan of having a couple PCIe X 1 slots in the middle of the PCIe X 16 slots. Since the x1 slots share bandwidth with the x16(x4) slot, they are somewhat superfluous. But, I’m sure some design engineer couldn’t leave an empty spot (or put old school PCI slots there). At least the x1 slots are the smallest slots you can put on a board. Plus, the one guy on earth who needs it, is going to be happy it’s there.